After 6 weeks on the hard, I was itching to sail despite the need to head for the boat while it was still dark and cold. I had obviously got soft over the summer! I was soon joined by Pete and Gina but no sign of Will. A bit of last minute preparation and we were away, without Will. Tide waits for no man and we literally hit as we left the berth and there was still an hour of tide to go. We eventually collected Him from C pier and headed for the start line. 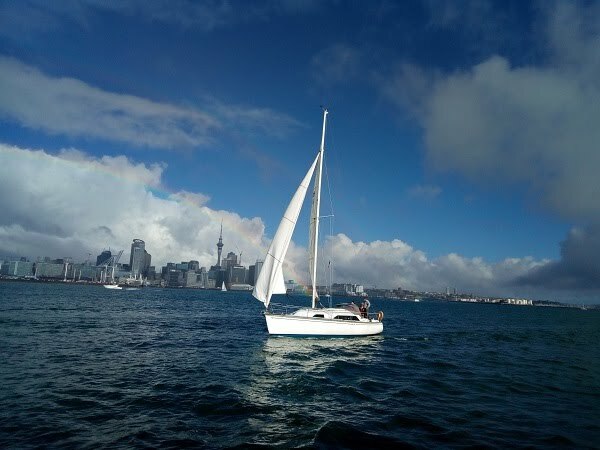 No bottle of wine for the start but we had clear air and with the gennaker up and a wide line around Kauri Point the boats ahead became the boats behind until only Champosa iwas ahead. Gennaker down as the wind came on the nose and we were comfortably in second. Nek minit Champosa was on the mud and we were in the lead! Nice feeling but short lived as Firsty soon came past. The rest of the chasers were still struggling to get good breeze and Champosa now clear of the mud had plenty of work still do. The wind she is a fickle mistress, and the Harbour Bridge to North Head was a series of gusts and lulls widening then narrowing the gap to Firsty in front and the rest behind. Despite the occasional gust bringing us closer to Firsty she slowly but surely pulled away while Champosa got ever closer and just before Rough Rock she passed us to windward . Two mudbanks in one day clearly too much to ask for. if you’re in it long enough the will to live. Firsty aced it and headed for the horizon leaving Champosa and ourselves to sail in small circles while we watched the boats behind slowly catching up. But good things come (eventually) to those that wait and finally with the fleet nipping at our heels the wind filled in from the North West and we were homeward bound. A beat but a pleasant one with just enough breeze that our no.2 Genoa was working well and we managed to put a bit of space on the following boats to be comfortably alone at the finish line. A welcome return to the water and winter racing. Here’s hoping the next race is as good. Race day started with having to tow Champosa out to the race course. I think it was a ploy so that we didn't have too much pre start time. Anyhow we were off to a good start in the light winds around the start area and thinking that the wind would head us at Kauri point we opted to stay with headsail. Champosa were off, and as Escape was charging outside us with a Gennaker, we decided on hoisting the No 2 kite to get us around. Soon enough we had to drop though, and back to headsail, and began to chase down Escape. No problem catching Champosa as they were aground on the mud. Managed to get past Escape as we hoisted the kite again at the bridge and we found ourselves in the lead. I'm sure it wont be too long before Champosa overhauls us again. We held the kite all the way to North Head where we dropped and found we were on the lay line to Rough Rock race mark. Around Rough Rock we hoisted the mast head kite but it was a bit more shy than anticipated. A gybe at Northern Leading and it was a tight reach back only just able to make Bean Rock, and well down on course for Resolution, so Headsail up and Kite down. Still a tight reach and quite a way to go to get to Resolution, so the call was made to hoist the Gennaker, then as we approach the mark we are headed so it's up with the head sail again, and the wind drops for a quiet ghost into the mark, then tack and get out into the tide. Unfortunately for Champosa and Escape the wind dropped completely at Resolution and they are left sitting as we power away at 5 knots. With a beat all the way home however, Champosa is looming behind getting bigger and bigger, but we just manage to hold her off and finish 3 1/2 minutes ahead of Chanposa and 17 minutes ahead of Escape to get line and handicap honours. Thanks to the team of Tim, Darcy, Tod, Lou and Dave for a good day on the water. A long race……..we have been looking forward to this one! Hang-over anyone? The morning after prize-giving mmmmmmmmmm. The wind is light but predicted to reach about 15knts so we opt for the No.1 headsail. I haven’t even thought bout the kite as we muscle our way through the fleet and settle into the reach towards the bridge. The lead boats are hoisting kites! I didn’t think that would be an option on this leg. The kite is prepared and the crew of Lisa, JK, Mark and Nicole hoist as we approach the harbour bridge. We manage to hold the kite till North Head and the No.1 is drawing well for the upwind leg to Rough Rock. One small tack and we are around. The first four boats seem to have a large lead over the rest of the fleet. We see two of the three lead boats stop at resolution Buoy…….out of wind! Firsty gets away and extends the gap. Eye Spy also is becalmed and we are horrified to see our advantage close down. We do get through the light spot and head after Escape. We do make up some ground but is it enough on handi-cap? Well well…….yes it is! We have Firsty in 1st, Eye Spy 2nd and Escape 3rd. Thanks to CCYC for allowing HYC to combine to make for the great fleet. Ok, the day didn’t start to good. Our Captain sat on the bench for this one, so I packed up nice and early to meet Spike and Hooks at the boat. Kettle on, nibbles + a couple of brews in the fridge. Silently frustrated as I couldn’t get the motor running, a couple of F words and some consultation with Hooks. We worked out the crank battery might be a little down on charge, motor sorted we dropped lines and headed to the start. Good to see 16 boats turnout and a course to head us out to the Rangi Channel, Mechanics Bay & home. We had a slow trip down the harbour to Northhead, had great breeze back to Mechanics Bay, Wild Horses + Satisfaction close to us at this stage. A few boats behind us and the rest well on the way up the harbour heading home. The boat went well and we had speeds between 4 & 8 knots and the boys shared the helm. carry us to the finish. Great day out, everyone on board appeared happy enough. Thanks Sam for the photo’s of us coming past the City.